haha, Odin’s like DON’T mention Ragnarok! Also, I’ve heard that mead (if that’s what he is drinking” actually tastes very bad.. 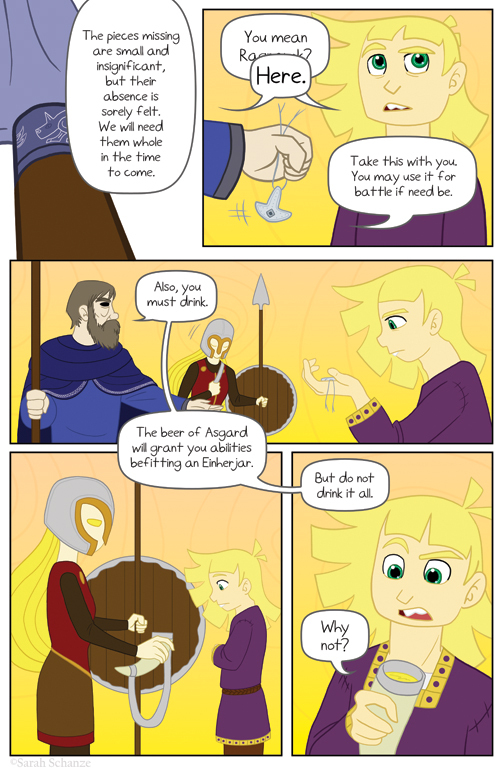 This comic is amazing- I can’t believe such a great comic, and one so directly from Norse myths, actually exists. made my day! Well, mead is made of honey… So imagine an alcoholic drink based on animal products instead of grain and… Yeah it’s not delicious. XD I’ll stick with plain juice, thank you. Thanks Bender I’m glad you like it! TMK updates every Thursday, so you don’t have to check back every day to see if a new comic was posted. And I’m not much of a wine fan either! I feel so pathetic that I have a hard time drinking alcohol. D: For me it’s mostly finding something less disgusting than something else. XD Thanks again! Thank you Valeriana! I haven’t actually had mead, just a few different alcoholic beverages, and it’s just hard for me to swallow them sometimes because they’re so bitter. XD Maybe someday I’ll try mead, if I ever get the chance. Just to say I did! Yes. I also have problems with a lot of alcohol. But I recently tried honey mead and it’s the bomb. I’ve had 2 types of meads, one was at a Renfest, and it was (supposedly) in an older style. it was not bad, but somewhat bland and not very strong. the other was from a local liquor store, and it was pretty sweet, more of a desert wine. I’m sure mead can be made many ways, but it was nothing like beer. I’m w/Valeriana, Astragali, and parissmiles. Not mead? Mead was the favored drink of the time. That’s why they were Mead halls and not Beer halls. Anyone, who’s the … entity standing at Odin’s left and giving Coal the drinking horn ? Is she a valkyrie ?